Greens Fees: $75 to $175 depending on time of year. Cost includes mandatory fore caddie. 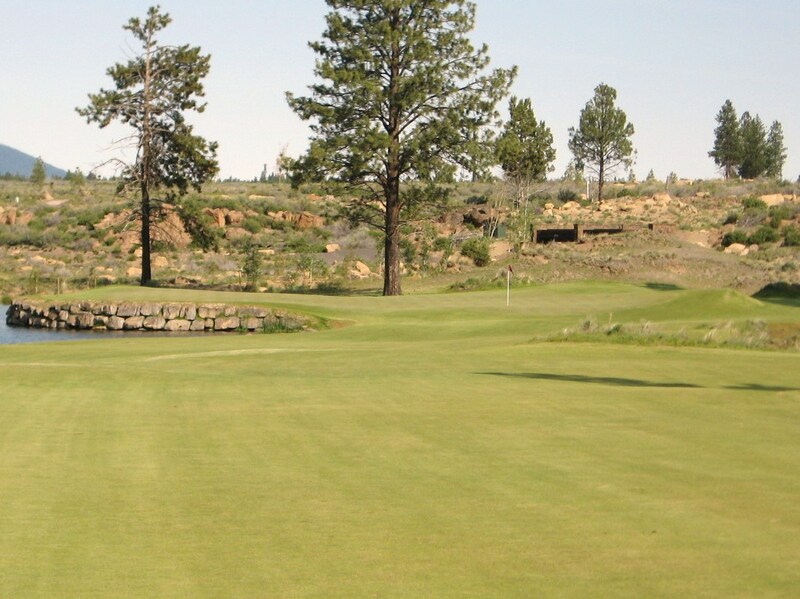 I was excited, as always, to visit Tetherow for a couple rounds of summer golf. 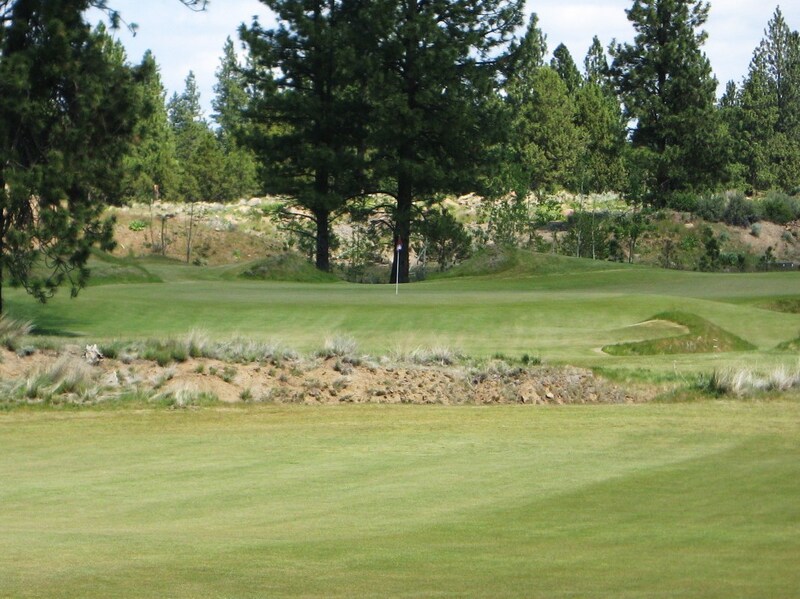 The course is about a 7 mile walk, which is long, but in Bend, OR which is one of my favorite golf settings in the world.. Since my last visit in 2011, there have been more changes to the course and I firmly believe that it is “right” and “fair” now. In fact, I hope they do not make the course any easier (which, unfortunately, they have subsequently done – edit in 2018). The “mohawk” mounds have all been removed along with quite a few bunkers. The changes have made the course a lot friendlier, especially for women and higher handicap golfers who used to have trouble carrying the various center line hazards or keeping drives out of the “junk” which has been thinned. If Tetherow had been built without limitations from surrounding housing corridors it could have been a spectacularly flowing walk across a brilliant site. But the housing corridors had been created when Kidd and his team were commissioned to design and construct the course. 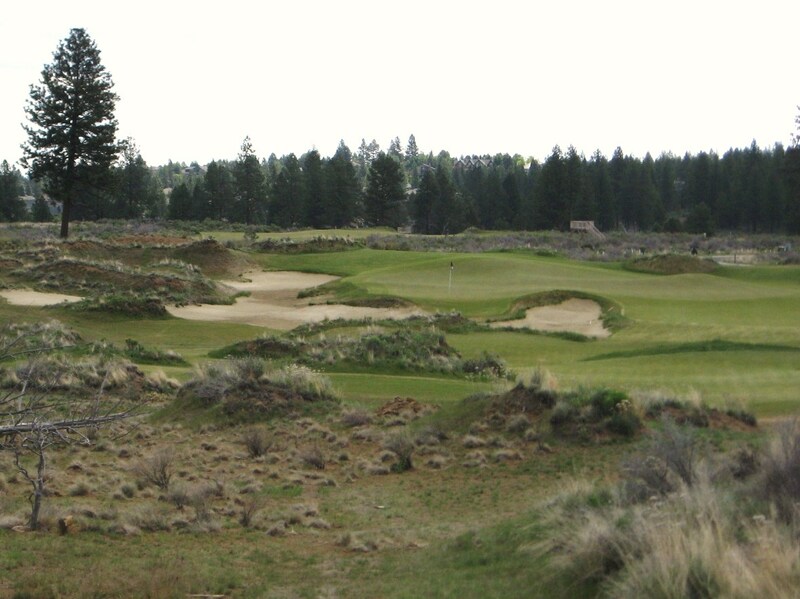 Tetherow is an example of why it is very difficult to create an ideal walking course when housing is a factor in the layout. However, the new ownership team, the super, the head pro and the architect have all worked to create a walking “spirit” at the club and I was very excited to see several groups of members playing with push carts or carrying their bags. The addition of walking paths on many holes has made the journey from tee to fairway a lot easier. 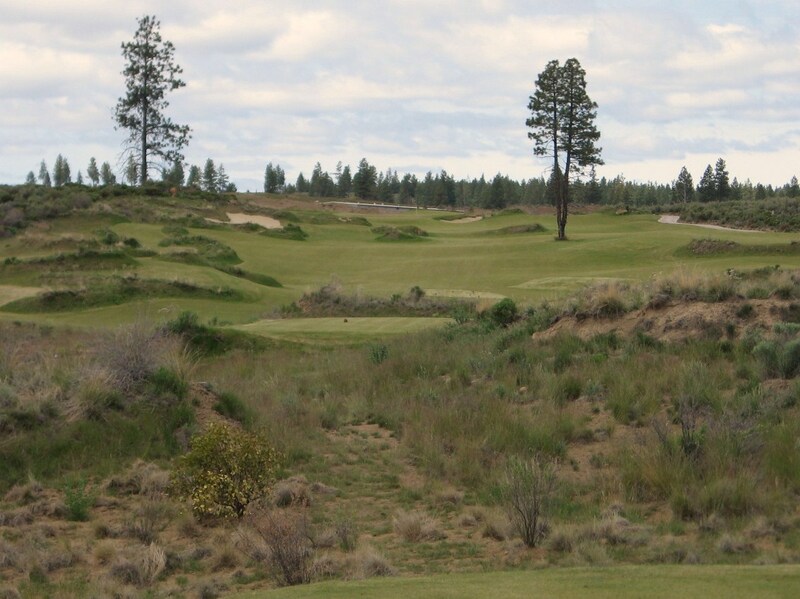 Paths have been cut through the high desert to make green to tee transfers easier as well, such as from the 9th to the 10th. The walk from 18 to the clubhouse is still a tough one and there are a few “longish” walks from green to tee, but overall, the walking improvements at Tetherow deserve high praise. Please note that any of the stunning photos you will see in the review are the work of the supremely talented Wood Sabold and provided courtesy of Tetherow. The other photos were taken by The Walking Golfer on his wee camera and are clearly inferior, although they do capture the recent changes made at the course. 6th hole at Tetherow. Photo by Wood Sabold. Use in review courtesy of Tetherow GC. 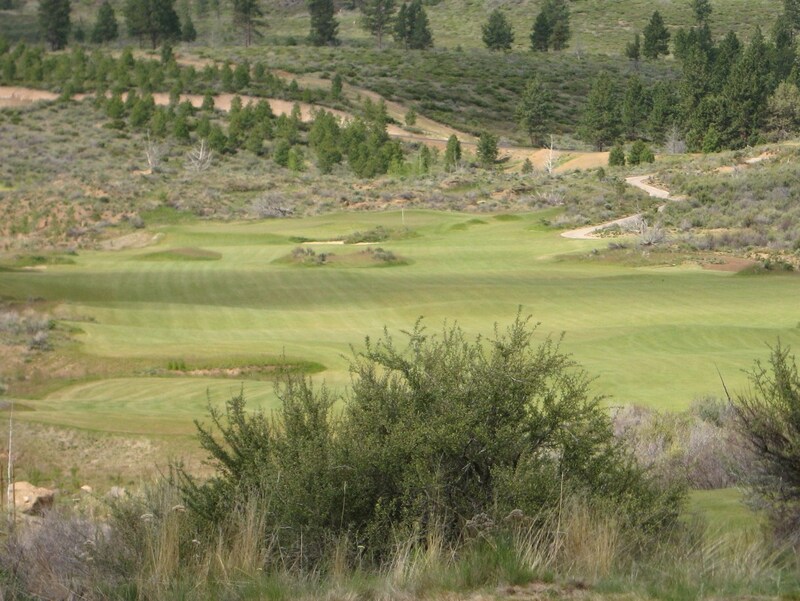 Tetherow is split up by several long green to tee transfers that move the golfer from section to section of the layout which is located on a 700 acre property. Overall estimated walking distance for a round is 7 miles, and it is worth it, although it may not be easy for every golfer. Tetherow launched to mixed reviews but it did receive some positive magazine ratings. 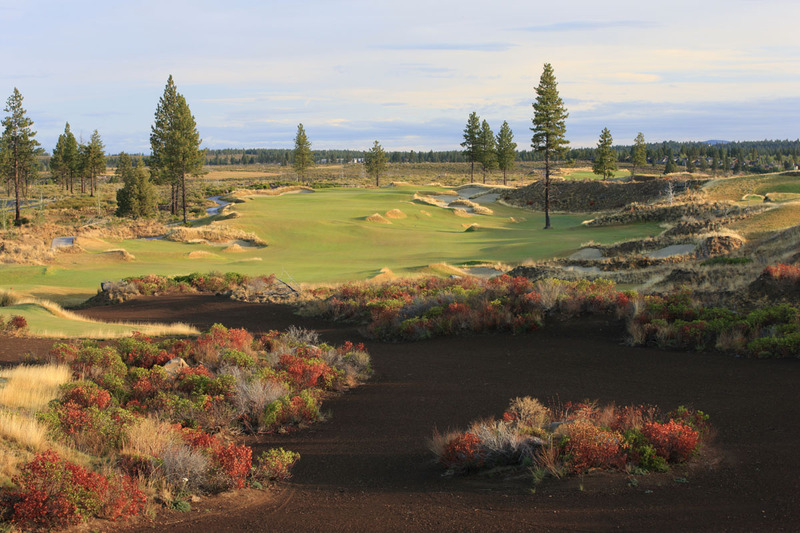 Golf Magazine rated Tetherow GC as the Best New Course of 2008, Golfweek named it one of the 10 Best New Courses of 2008 and Links Magazine also had it on their 2008 Best New Courses list. 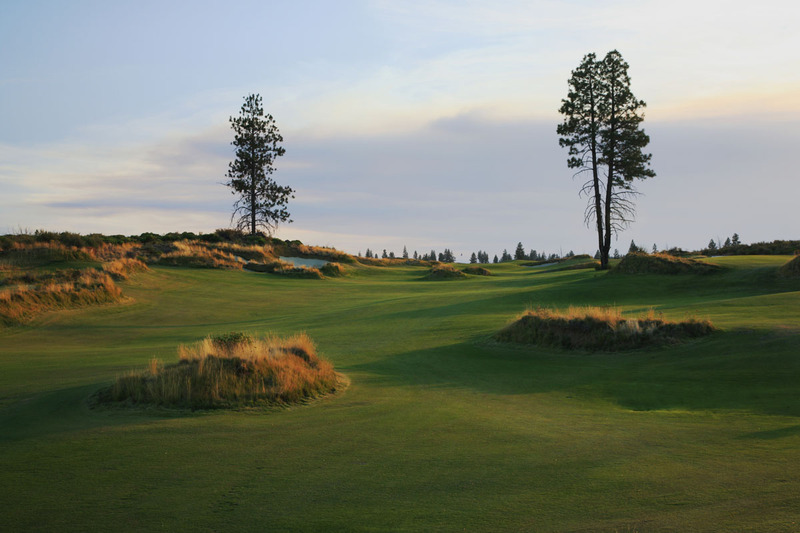 Golf Digest rated Tetherow as the 10th best course in Oregon in 2017 which isn’t bad considering the company it keeps several hours away at the coast. 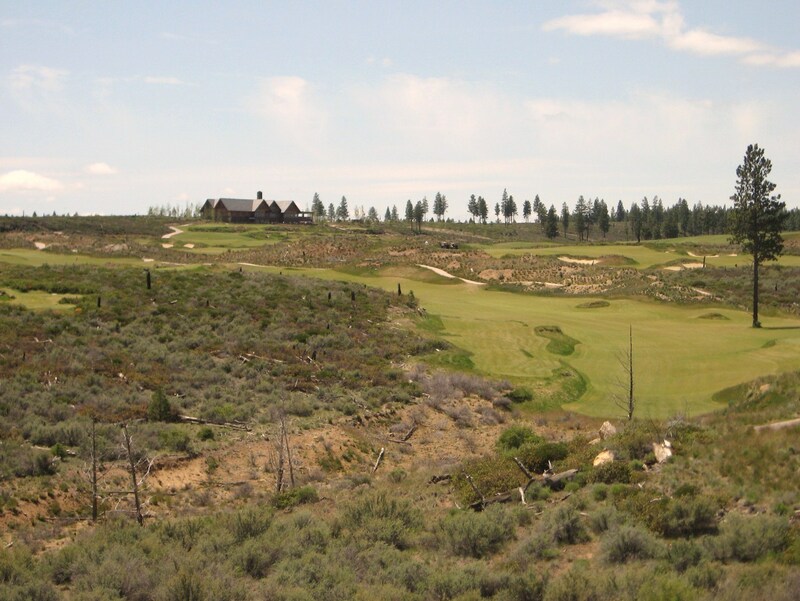 The intense visual imagery found throughout the course, the motion of the fairways and greens, and the beautiful high desert setting make Tetherow a dream course in many respects. It is strategic, supremely challenging and the golfer must be on their game to score well. 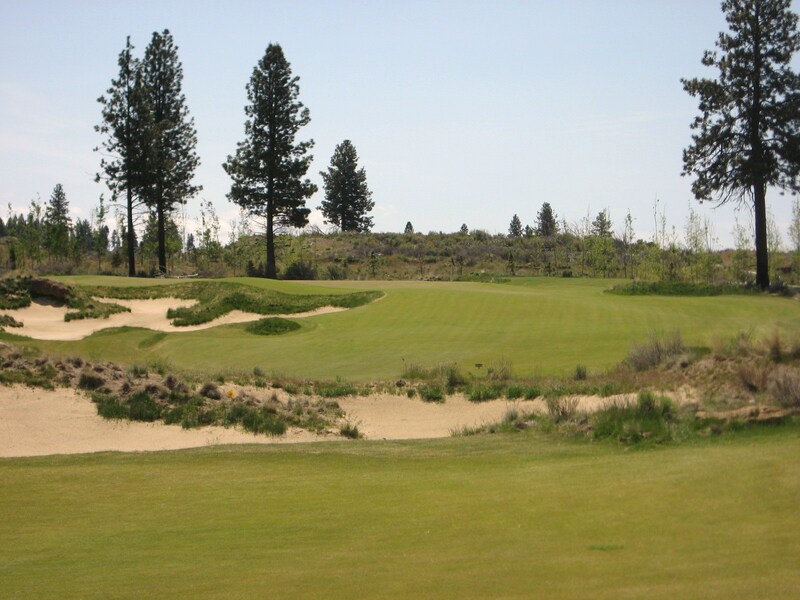 Kidd has provided multiple playing options on many holes and the greens are often multi-tiered and undulating. 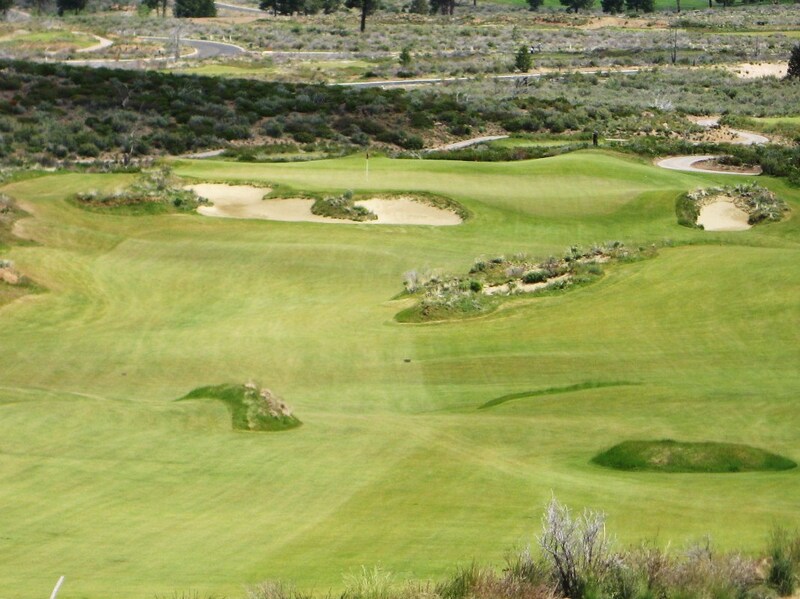 The scenery is breathtaking and the fescue based course melds seamlessly with the high desert environment. and flattened to speed up play and make the course easier. 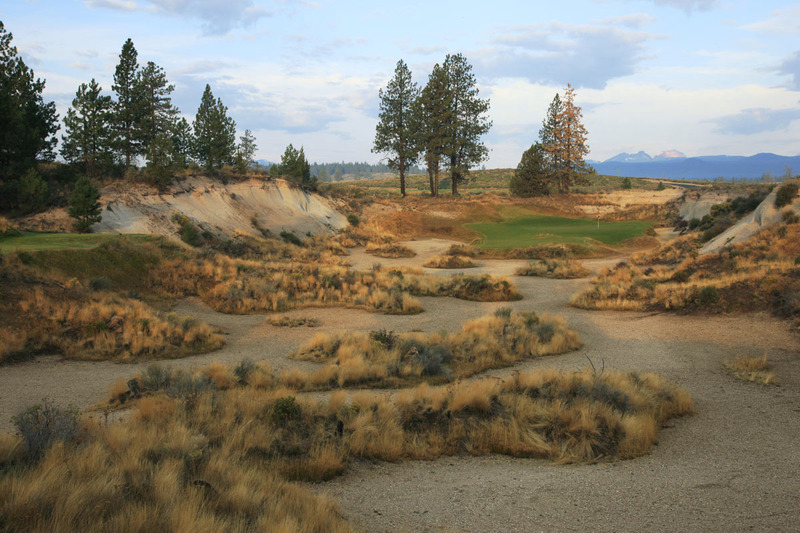 Since its opening, Tetherow has been “toned down” after complaints from both members and visitors about the severity of some of the mounding features, greens, long grass and bunkers on the course. For example, in the photo above, the two mounds in the fairway and the one to the right of the tree have been removed and/or flattened. 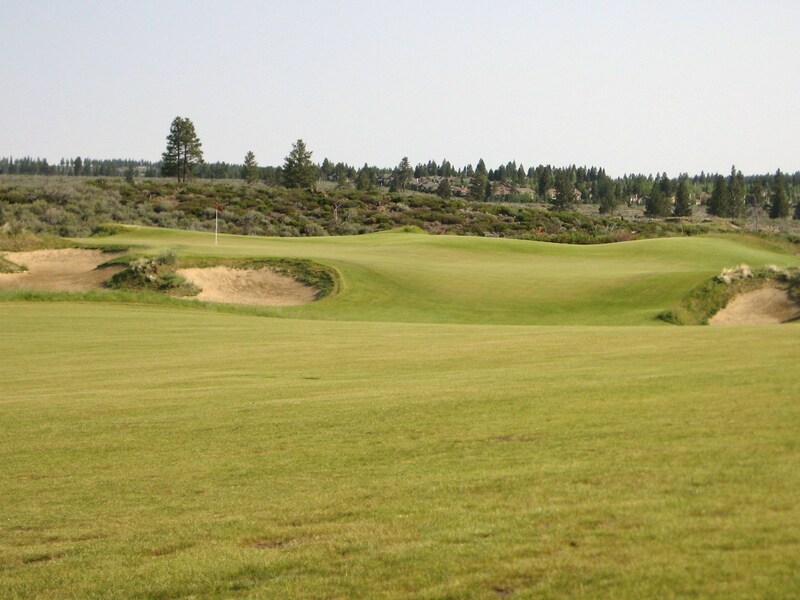 The fescue based fairways and greens make Tetherow unique amongst the other solid courses in the area such as Pronghorn, and Juniper (a super affordable public that SHOULD be visited!). 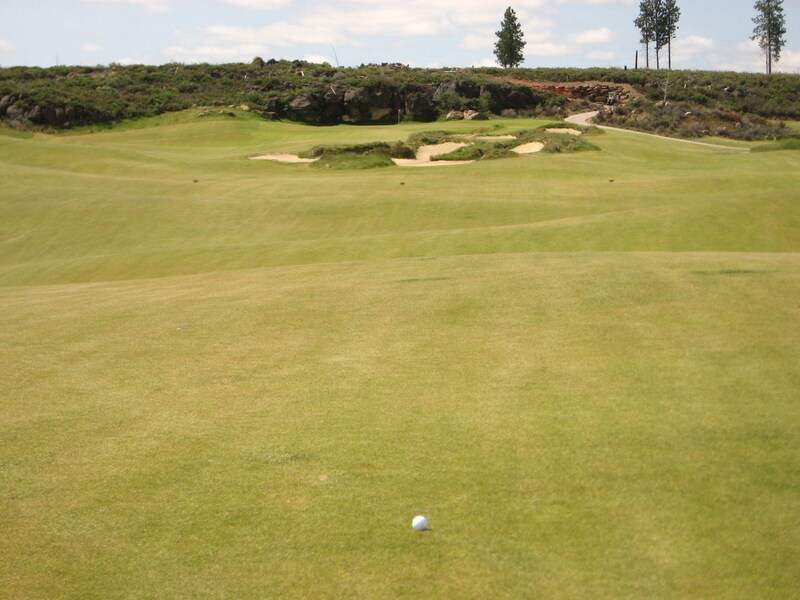 There are no easy two putts and the fairways play firm and fast throughout the year. Golfers who are used to target golf will be in for a huge surprise, as success at Tetherow calls for a sound strategy that must be effectively executed in order to score well. While the fairways are often quite wide, placement off the tee is vital to securing the optimal approach. The wildly undulating greens make it difficult to get the ball close to the pin so firing at the target is rarely the best play. It will take some time to master Tetherow, if that is even possible, as the course changes on a daily basis with the wind. 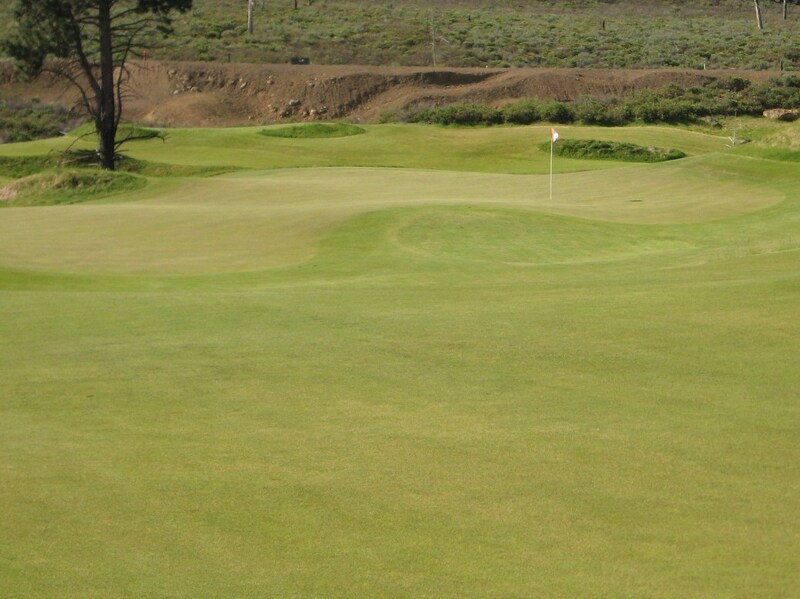 The greens at courses such as Old Macdonald and Ballyneal receive high praise, and rightly so. 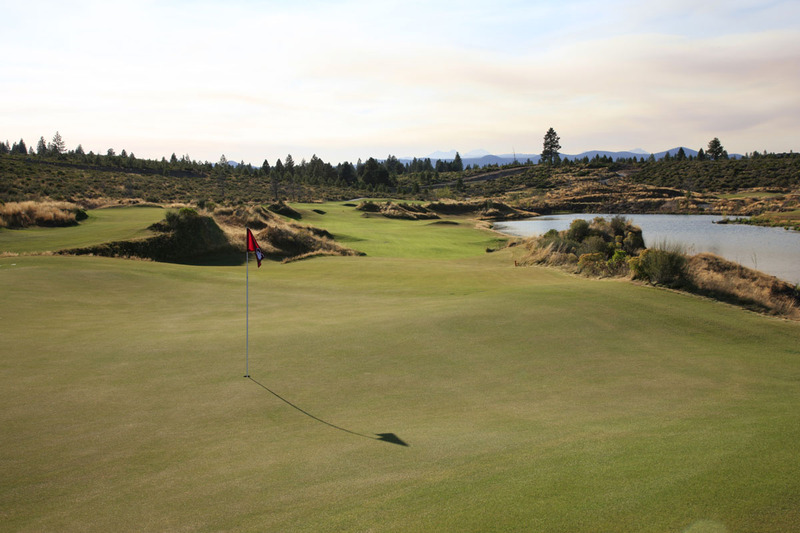 The undulations on the greens at Tetherow are similarly interesting, although they do not roll quite as purely as those at Bandon Dunes Golf Resort. A “links” mindset should be embraced at Tetherow as creativity around the greens is very much rewarded. However, there are few opportunities to run the ball onto the green as the course demands many uphill aerial approach shots. 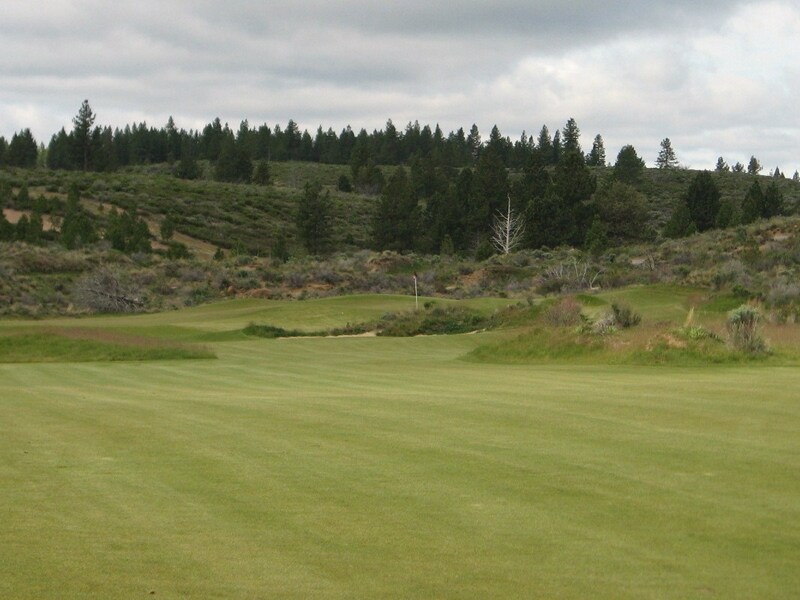 The first at Tetherow is a great introduction to the course. 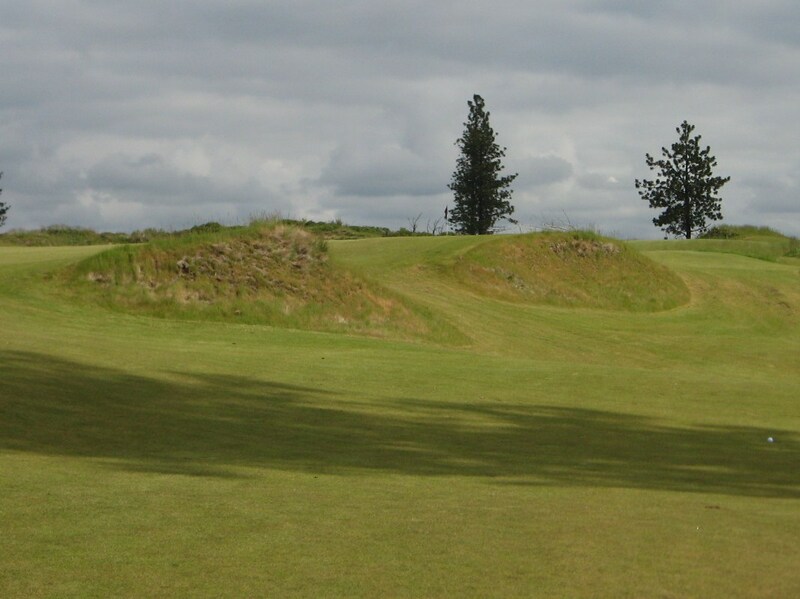 A waste area fronts the tees, there is ample room in the fairway but danger on both sides, mounds dot the landscape, and there is a ton of movement and undulation. As you stand on the first tee your senses should be tingling since there is a lot to process. Take your drive down the middle of the fairway and you will have a short iron to the elevated green. 1st at Tetherow. Photo by Wood Sabold. Use in review courtesy of Tetherow GC. The ideal drive below leaves a little over a hundred yards to the green. Hopefully you remembered your pin sheet because most of the putting surfaces have a lot of movement that make an approach to the appropriate section a necessity for scoring. 1st Fairway at Tetherow. Photo by Rob Rigg. As you can see below, nothing can be taken for granted on these greens. Buried elephants, hippos, taxis and boring golf course architects lie beneath the putting surfaces at Tetherow. 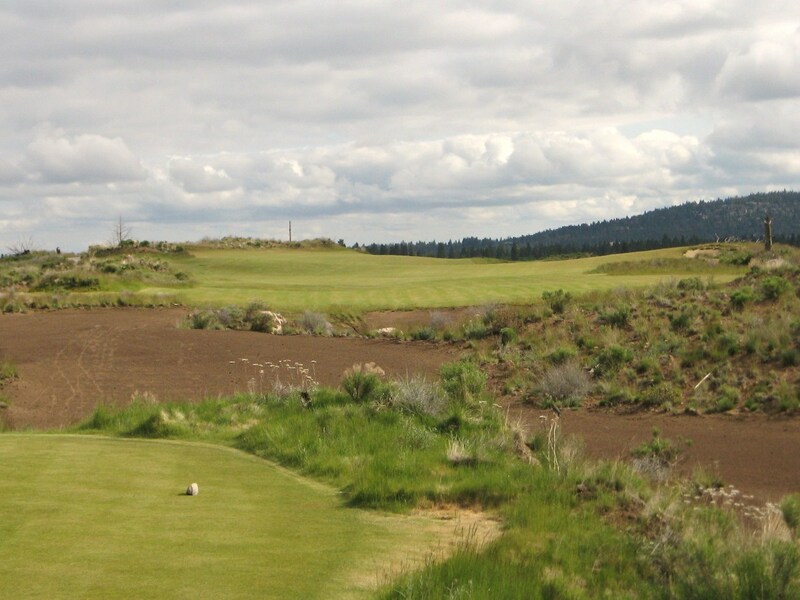 After putting out on the the first it should be obvious to the golfer that your experience at Tetherow will be a strategic battle between you and the architect – so get focused and play to your strengths. 1st Green at Tetherow. Photo by Rob Rigg. The par five second can be reached in two with a long drive down the right side. Originally, there was a more obvious division in the fairway, but the long grass and mounding has been minimized, although some tufts of rough still indicate where the fairway splits. 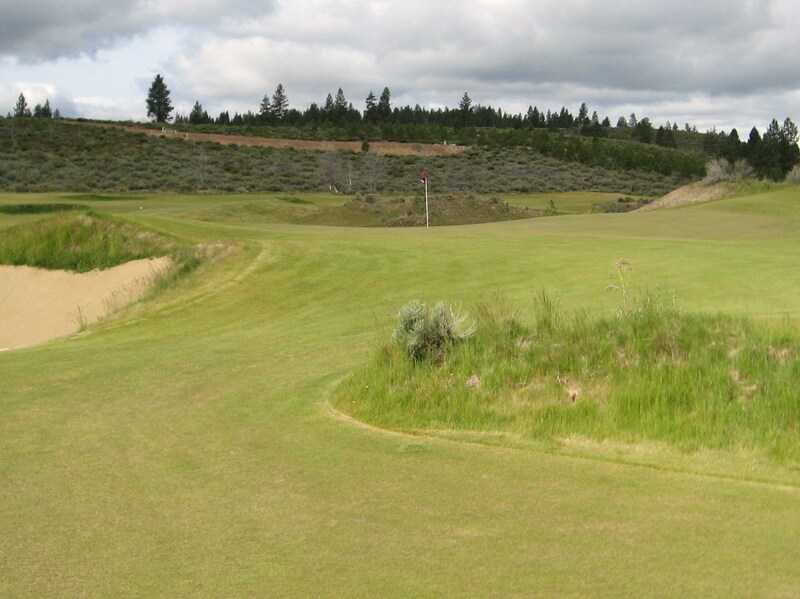 A drive down the left will funnel down to a valley while the right side has a speed bump that accelerates the ball to a flat section with an elevated view of the green. This semi-blind tee shot is a lot of fun because you never know where your ball end up on these firm and fast fairways. 2nd Tee at Tetherow. Photo by Rob Rigg. The right side provides a better view into the green while the left makes for a more challenging second if you are attempting to get there in two. The visual stimulation is still remarkable even though it has been softened. Hole #2 Approach at Tetherow. Photo by Rob Rigg. After finishing the second, the golfer has to walk across a bridge to reach the four hole segment of the course known “Kidd’s Corner” which contains a good one shotter and three solid par fours. From the tips, the third is a challenging par three over a pond. Kidd has used a mound, located in front of the flag on this day, to create some depth perception uncertainty off the tee. The right is much safer than the left and slightly short of the green is better than long as it slopes back to front with a ridge in the middle. 3rd Tee at Tetherow. Photo by Rob Rigg. If you have not noticed already, there is very little rough at Tetherow so an ability to chip off tight lies is invaluable to scoring. 3rd Green at Tetherow. Photo by Rob Rigg. The fourth is the longest two shotter on the course and requires a deep and well placed drive to set up a short to mid-iron approach. An “ESA”, or Environmentally Sensitive Area, used to run up the left side of the hole but it has been removed and now plays as a hazard. The safe place to aim is the middle or right side of the fairway. However, a daring shot up the left will leave the best line into the green. There is an “cape” hole quality to the tee shot. 4th Tee at Tetherow. Photo by Rob Rigg. The approach, like the first, is uphill to an undulating green. The bunker on the right side looks like it belongs on a links somewhere and should obviously be avoided. The left middle of the green is the safest place to aim, but if the pin is on the right side it will leave a difficult two putt. Approach to the 4th at Tetherow. Photo by Rob Rigg. The fifth runs back to the pond and the former ESA is once again on the left side of the hole. A wide fairway awaits so swing away, but if possible place your ball on the left side as it provides a better angle into the green. 5th Tee at Tetherow. Photo by Rob Rigg. The approach shot must traverse a fore-bunker and mounding that is farther from the green than it looks. Approach to 5th Green at Tetherow. Photo by Rob Rigg. 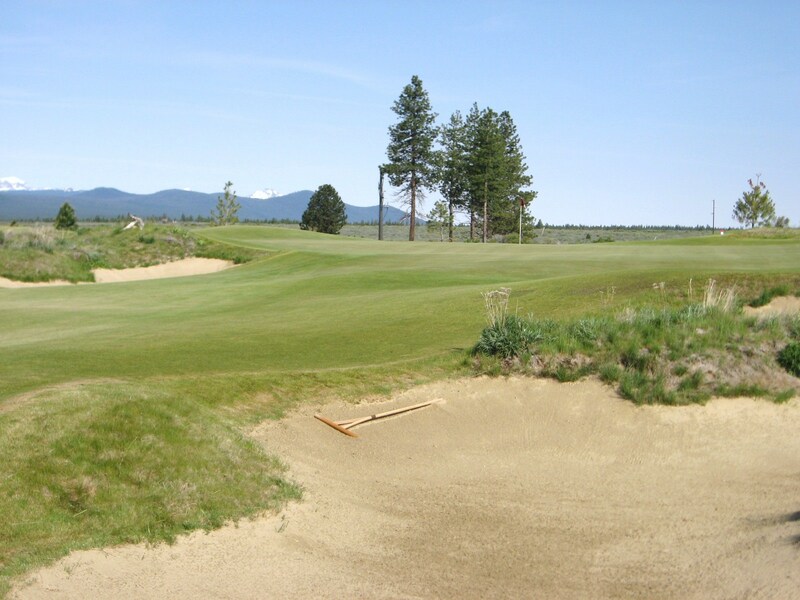 5th fore-bunker at Tetherow. Photo by Rob Rigg. but is has been removed as seen below. Since the green is quite shallow and wide, the front bunker got a lot of play because it was very difficult for a low spin hitter to hold the green with a mid to long iron. 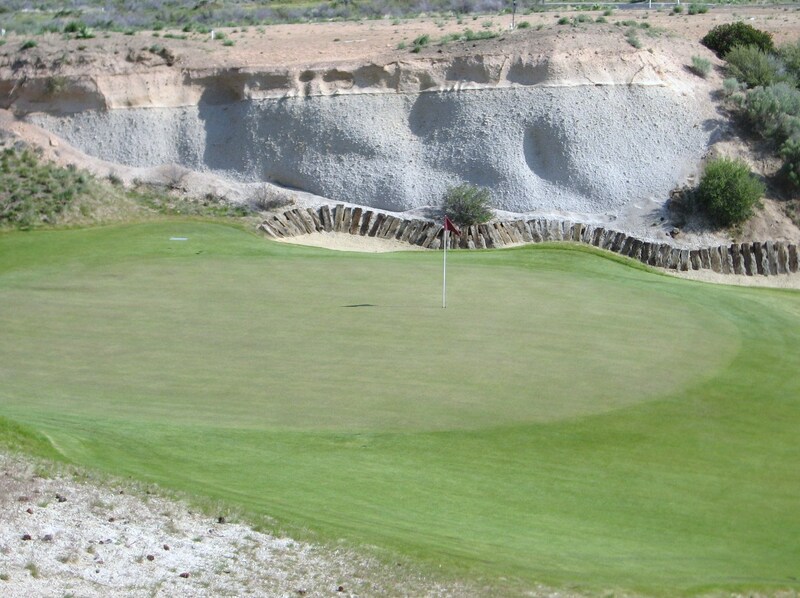 Anything short will leave a chip and a putt instead of a sandy for par. 5th hole bunker removal. Photo by Rob Rigg. The tee shot at the par four sixth is intimidating, but not as daunting as it was when the course opened. The architect provides the golfer with two choices – take the right fairway and leave yourself a blind approach to a very difficult green, or play it at the bunkers in the left fairway and hope you do not hook it into the pond. The mounding and long grass that used to separate the two choices were thick and nasty last year, but it looks like a ball played up the middle will have a good chance of ending up in the short grass after the alterations. There is still a lot to process from the tee, but the options are more clearly defined. 6th Tee at Tetherow. Photo by Rob Rigg. From the right side the green is blocked by the mounds, while the sight lines are clear from the the left. 6th Fairway at Tetherow. Photo by Rob Rigg. The green has a small lower section and larger upper section, which demands an aerial approach. After the sixth hole, the golfer must walk back across the bridge and out of “Kidd’s Corner” to reach the par three seventh tee which is located near the second green. The seventh has been toned down significantly, as the bunker that used to run down the left side of the green and across the front has been severely reduced. Now there is a small bunker in front and a medium bunker to the left which makes the hole much more playable although the green is still very undulating. The architect has provided a back-board that is very useful in catching long shots and drawing them back to the center of the putting surface. 7th Tee at Tetherow. Photo by Rob Rigg. For 2009, the hole had been tempered as shown below, with further changes made for 2010. 7th Green at Tetherow. Photo by Rob Rigg. 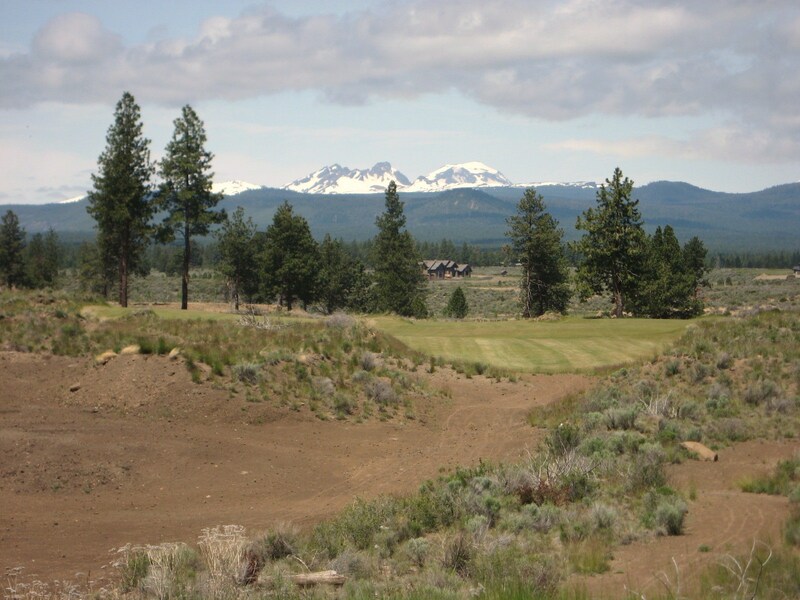 The vista of Broken Top and the Three Sisters in the background is breathtaking and the golf course blends effortlessly into its high desert environment which only adds to the experience. A putt from the back of the seventh to the front is something to be avoided. The two shot eighth is under four hundred yards, but no pushover. The tee shot was more difficult last year as two mounds were located in the middle of the fairway and another short-right of the tree. These have been removed which has opened up the landing area. A long iron or fairway wood will put the golfer in a good position to attack the green with a short iron. 8th Tee at Tetherow. Photo by Rob Rigg. 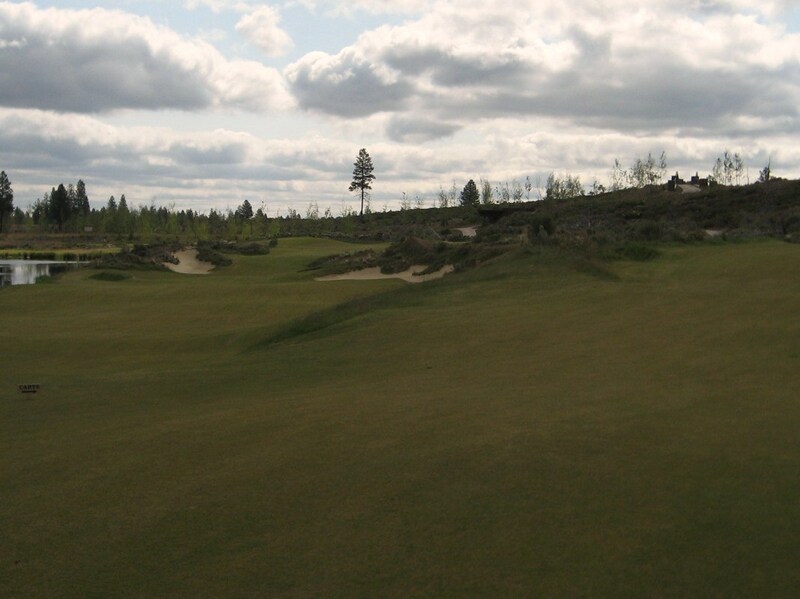 Similar to the first and fourth, an uphill approach must avoid the bunker on the right side. Approach to the 8th at Tetherow. Photo by Rob Rigg. 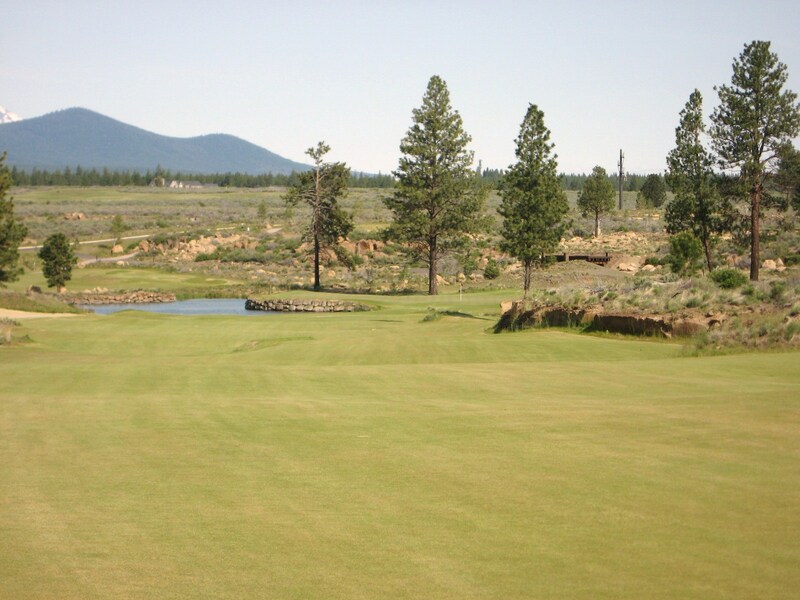 The green slopes from back to front and is split by a large ridge that makes a two putt difficult from the wrong level. 8th Green at Tetherow. Photo by Rob Rigg. The tee shot on the ninth is fairly open so swing away. The attention to detail in the bunkers on the left is very well done as they are nestled between short grass above and below. Neither should come into play off the tee as there is ample room to the right, although a slice or push might be caught by the bunker over there. 9th Tee at Tetherow. Photo by Rob Rigg. If you crush your drive, this is what you have left. About 225 yards with a logical bail out left, a tricky bail out right, and a lot of bunkers between you and the shallow green that had a really difficult pin placement on the back shelf on this day. 8th Fairway at Tetherow. Photo by Rob Rigg. 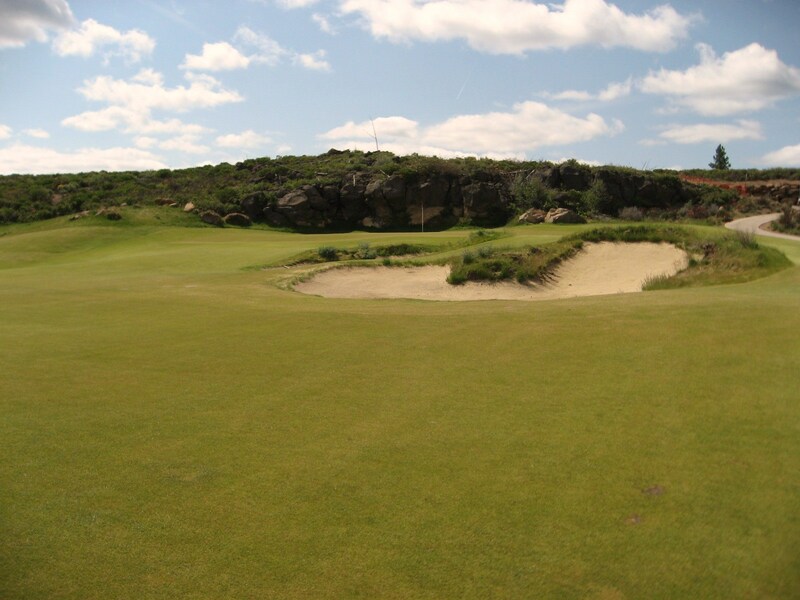 There is a gap between the fore-bunkers and this beauty, with another bunker tucked in behind it. The rocks may look like a back board to help out any long approaches but they are neither forgiving nor predictable. Keep your lay up to the left, run the ball onto the green, try to make your birdie and be happy with a par to close out the front nine. Short of 9th Green at Tetherow. Photo by Rob Rigg. 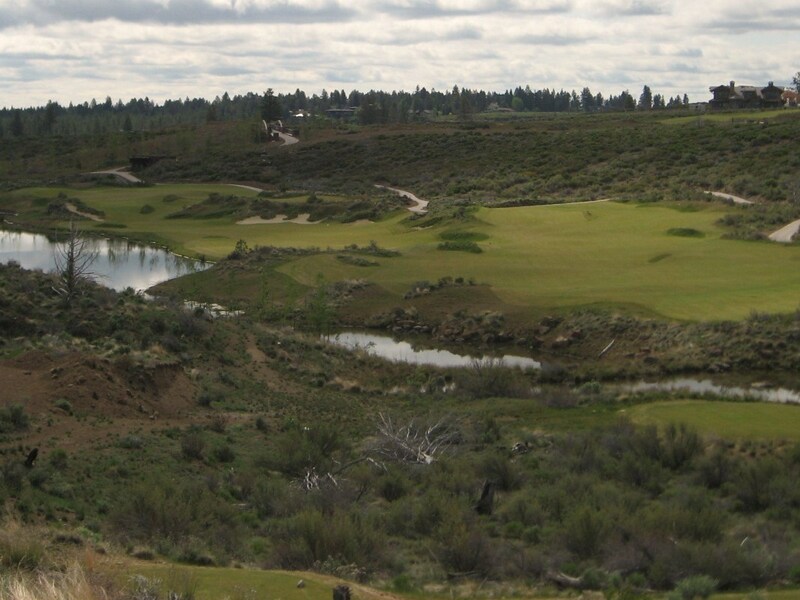 The tenth is a par 3.5 and one of the few holes at Tetherow where you can take back a shot. You can try to drive the green or lay up, but the driver is clearly the best option! 10th Tee at Tetherow. Photo by Rob Rigg. The green is protected across the front left by a bunker and on the right by a false front. A lay up will leave a tricky pitch to a pin located behind the bunker, while a drive into the sand will leave an opportunity to get up and down for birdie. 10th Green at Tetherow. Photo by Rob Rigg. Eleven has more trees than any other hole on the course and they create a corridor for the tee shot that should be aimed at the patch of rough on the left side of the fairway. The optimal drive is a power fade which will hit the slope on the left and run along the short grass leaving a mid-iron to the green. 11th Tee at Tetherow. Photo by Rob Rigg. 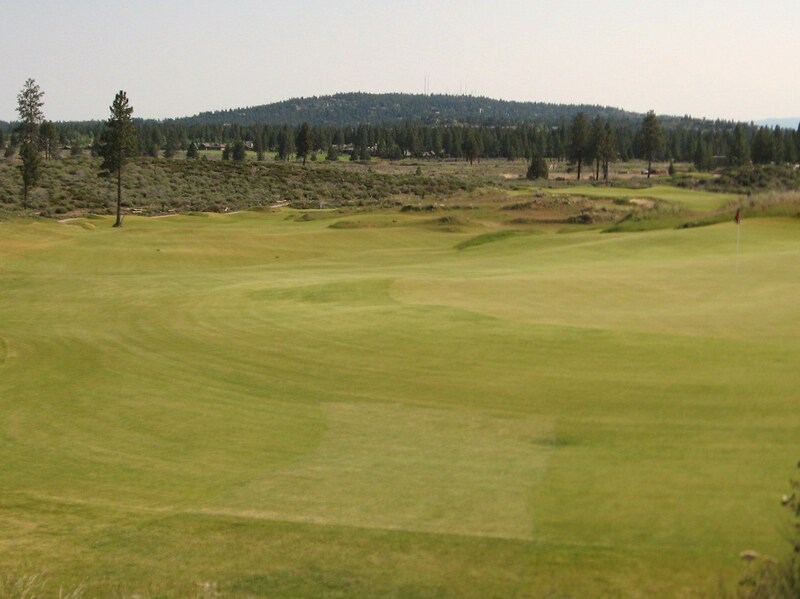 The eleventh green is unique to Tetherow. A steep slope with rough and long fescue runs along the front bank protecting the mid-front section of the green. The right side is the best approach regardless of pin position as it is very tough to make anything hold the left side. 11th Green at Tetherow. Photo by Rob Rigg. When you step onto the tee at twelve your senses will be overloaded by the gnarly waste areas, bunkers, trees and mounds. The fairway, however, is wide open and welcoming so just knock it out there and get a mid or long iron ready to attack the green. Several mounds have been removed from the fairway which make the drive a lot easier on the nerves than it was when the course opened. 12th Tee at Tetherow. Photo by Rob Rigg. The green is wide and shallow like many of the others on the course. The left side is partially guarded by a tree that imposes slightly on the approach shot while a bunker protects the right side. 12th Approach at Tetherow. Photo by Rob Rigg. After finishing twelve, the walking golfer has a bit of a hike through a tunnel to get to the next section of the property which contains holes thirteen through fifteen. 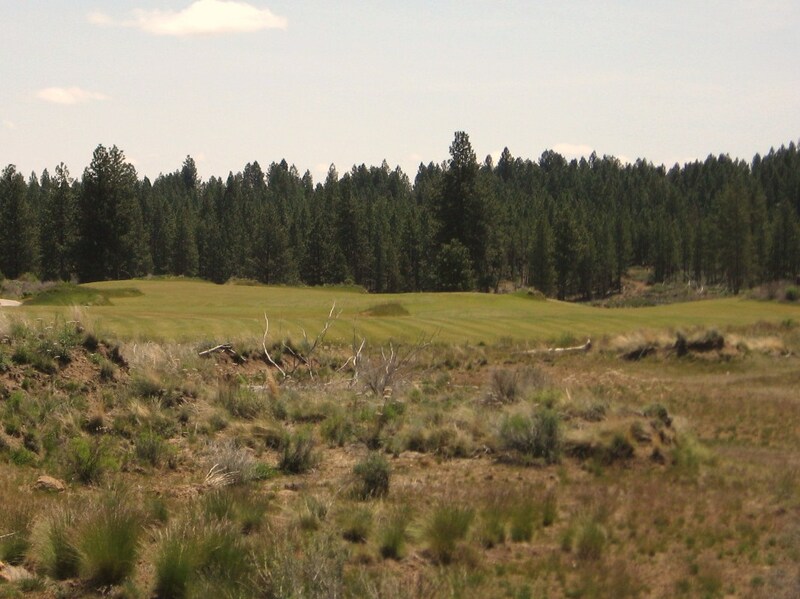 Thirteen is the first three shotter on the back side and it features a semi-blind tee shot that should be aimed between the two trees down the middle and directly at the mountain. 13th Tee at Tetherow. Photo by Rob Rigg. The pond makes a fairway or long iron approach more challenging and there is plenty of room to lay up to your ideal wedge distance. 13th Fairway at Tetherow. Photo by Rob Rigg. A pin middle or right is very accessible with a wedge which could leave a great look at birdie. If the pin is tucked behind the pond and the wind is blowing then thirteen can be a tough par. 13th Approach at Tetherow. Photo by Rob Rigg. Fourteen is fairly plain vanilla when compared to the other holes at Tetherow. The long and wide green is protected by a bunker short right and another tight left. 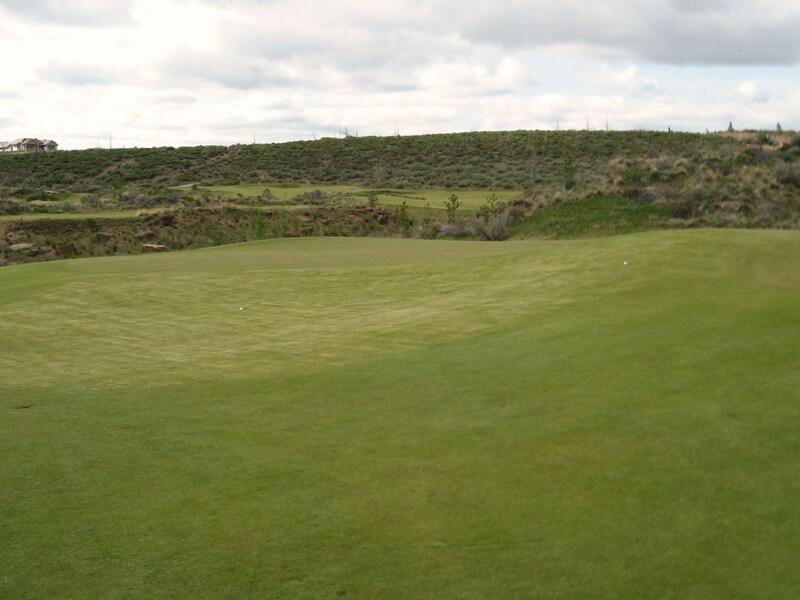 A tee shot to the middle of the dance floor should leave an easy two putt, but anything landing on the opposite side of the green from the pin will bring bogey into play. Remember, nothing comes easy here. 14th at Tetherow. Photo by Rob Rigg. 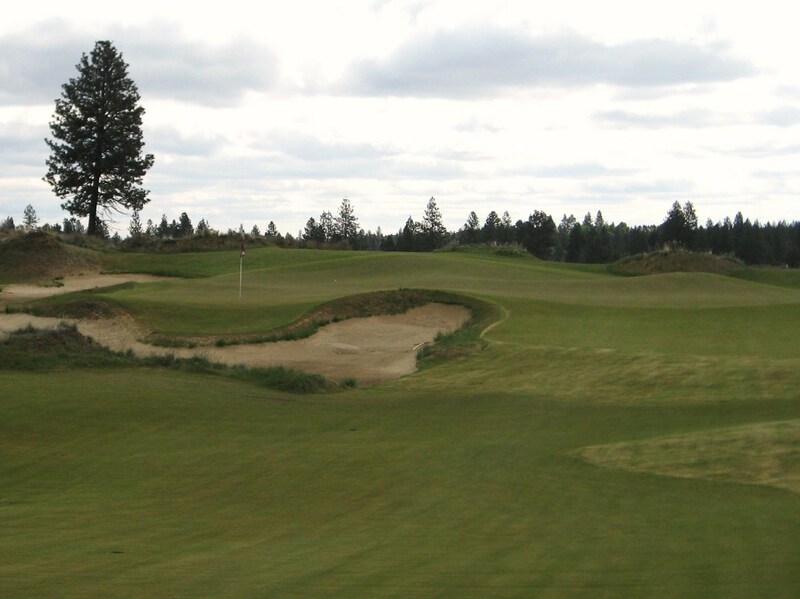 The fifteenth and sixteenth round out the series of great par fours that exist at Tetherow. Fifteen calls for a long and accurate downhill tee shot ideally positioned to the left of the bunker. The landing area has been widened with the removal of rough and tall grass short of the large fairway bunker, which should keep the pond on the left even more out of play. 15th Tee at Tetherow. Photo by Rob Rigg. 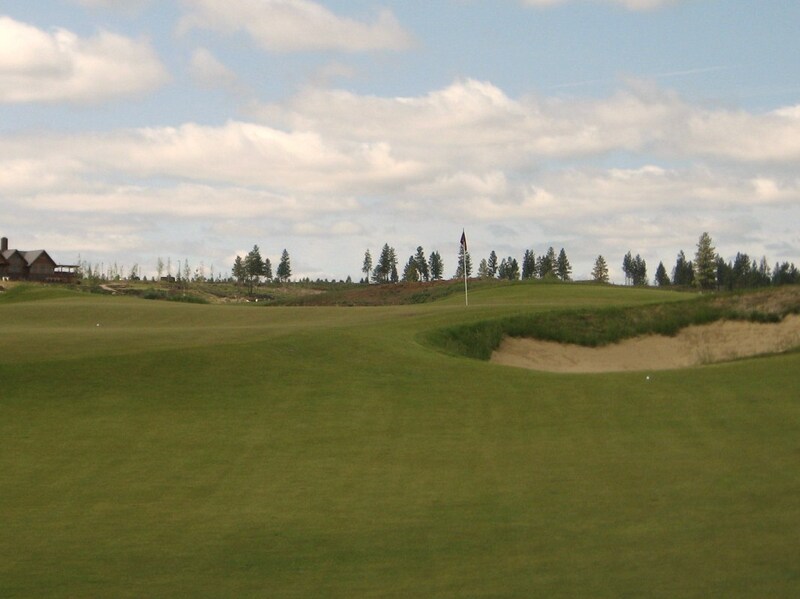 The approach from the fairway is uphill to a green that is split into three sections – back, front left and front right. The bunker protecting the front left side of the green is majestic yet frightening. There is room to bail out on the right, but some long grass over there can make an up and down almost impossible. 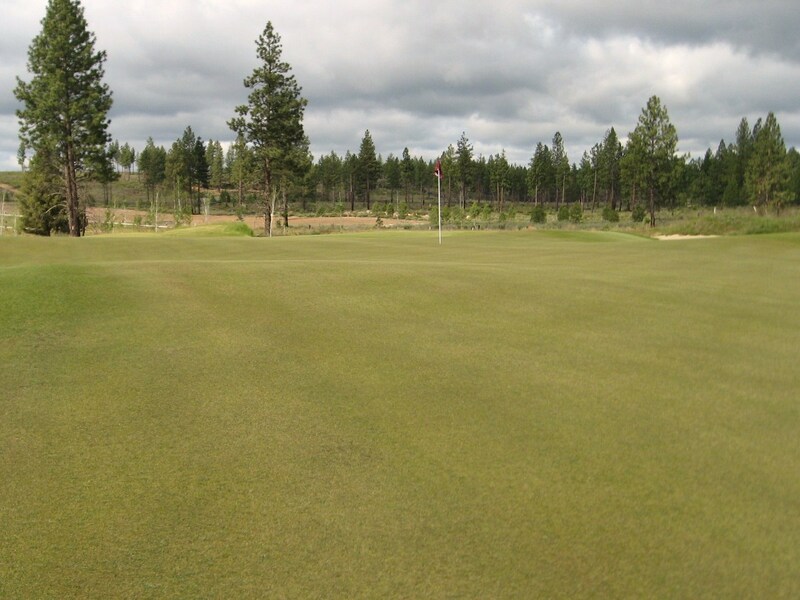 Play for the middle of the green and try to make a putt. 15th Approach at Tetherow. Photo by Rob Rigg. 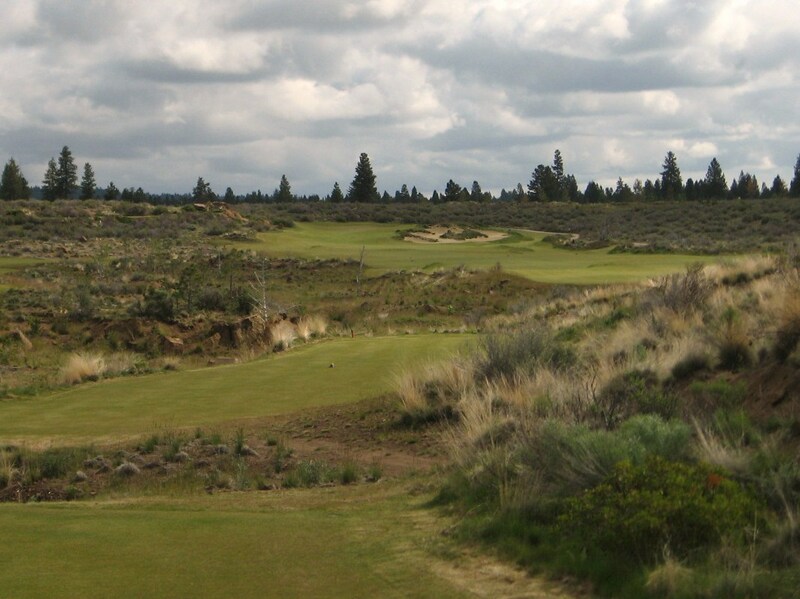 The final two shotter at Tetherow was the most controversial when the course opened, but it is a bombers delight now. A large bunker and several mounds were removed from the fairway. Unfortunately, what was the most exciting tee shot on the course is now almost too easy. Just rip it at the tallest tree in the distance and catch the speed slot to leave a short iron second. 16th Tee at Tetherow. Photo by Rob Rigg. A downhill approach from the fairway is uncommon at Tetherow and a welcome change of pace. Over the green is dead, so keep your approach short and let it run up onto the putting surface. 16th Approach at Tetherow. Photo by Rob Rigg. 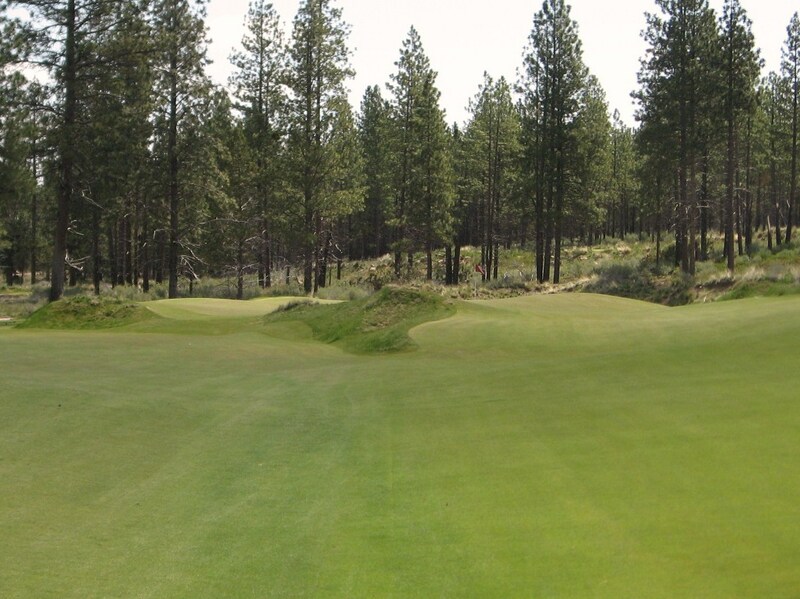 The sixteenth green has three distinct sections – back right, middle and front left. The fronting bunker was removed to make the approach, or recovery from short, easier. 16th Green at Tetherow. Photo by Rob Rigg. 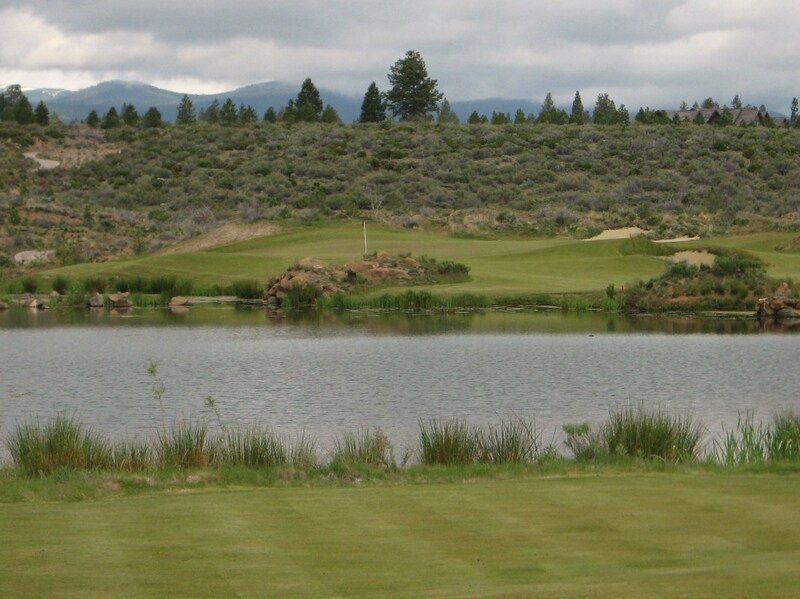 The seventeenth at Tetherow is probably one of the most stunning short holes a golfer will ever lay their eyes on. 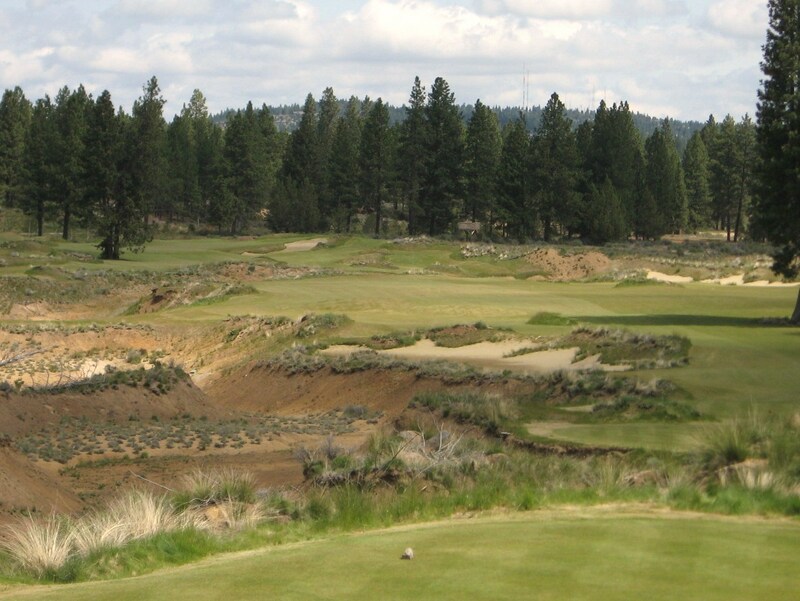 Situated in an old pumice quarry, the slightly elevated tee shot sets off towards the Cascade Mountains in the distance before dropping onto the 2500 square foot green below. 17th at Tetherow. Photo by Wood Sabold. Use in review courtesy of Tetherow GC. Railroad ties have been used on the right side of the hole to keep the sand in place and stabilize the quarry wall. Although the putting surface is tiny, the side and back boards make it play bigger. Any tee shot on the green has a chance at birdie since this is likely the most sedate putting surface on the course. 17th Green at Tetherow. Photo by Rob Rigg. 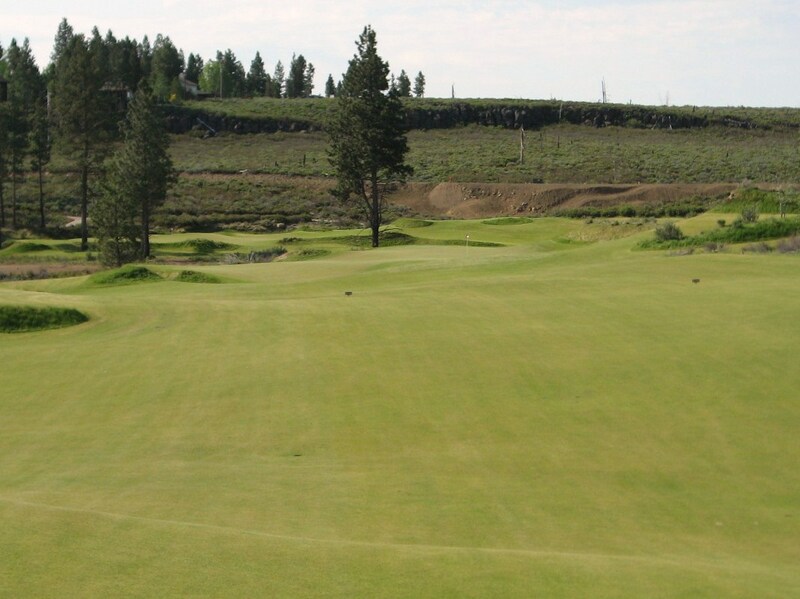 The “home” hole at Tetherow takes you back towards the clubhouse while providing a rare opportunity to make up a shot. This hole seems to get some flak for being too easy but after battling the architect almost everywhere else on the course it is nice to have some respite before hitting the 19th hole for a well deserved beverage. Furthermore, as the final hole in a match, eighteen provides a lot of excitement as two solid woods can bring eagle into play and make par seem like a bogey. What you see is what you get. Smash your drive onto the awaiting fairway and get out your three wood for a go at the green. 18th Tee at Tetherow. Photo by Rob Rigg. Looking back down the eighteenth it is obvious that one – the hole is uphill – and two – there is a lot of room so laying up provides little benefit. The green is no push-over and Kidd continues to protect par on the final hole with undulation. The putting surface slopes from front to back and there are three sections and a false front so the approach needs to get all the way to the pin. 18th at Tetherow. Photo by Rob Rigg. 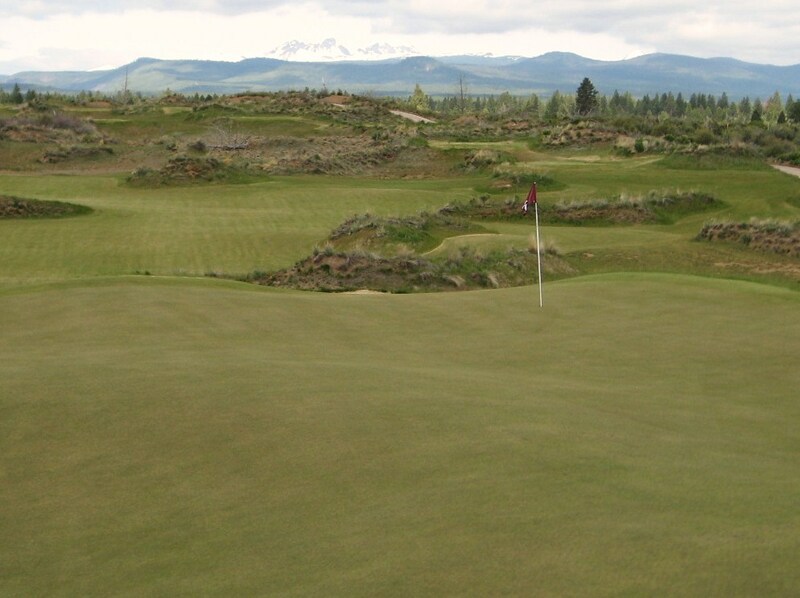 A round at Tetherow isn’t cheap but it’s worth a play if you are visiting the area. In terms of Walkability, I would rate Tetherow a 2 out of 4 (up from 1.5 when it opened), because paths have been added that make the walk both easier and more enjoyable. 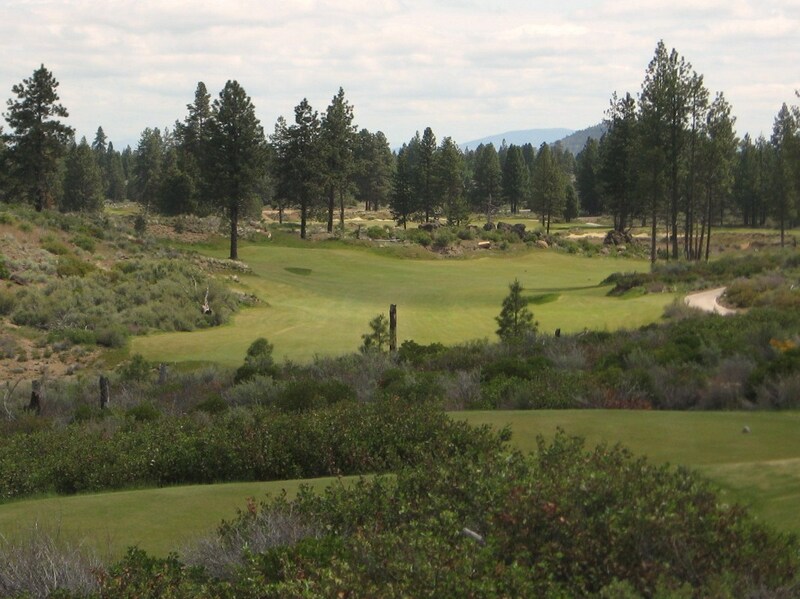 Tetherow may not be an easy jaunt, but it is well worth the effort because there are a lot of design elements that can only be seen from the fairways at a walking pace and the setting is spectacular. The Aesthetics at Tetherow are wonderful, while the Architecture will please some and frustrate others. Many “scratch” golfers will complain because it is so hard to score on the greens, and many “bogey” golfers will complain that it is overwhelming. I firmly believe the design is demanding, stunning , fair and thought provoking. 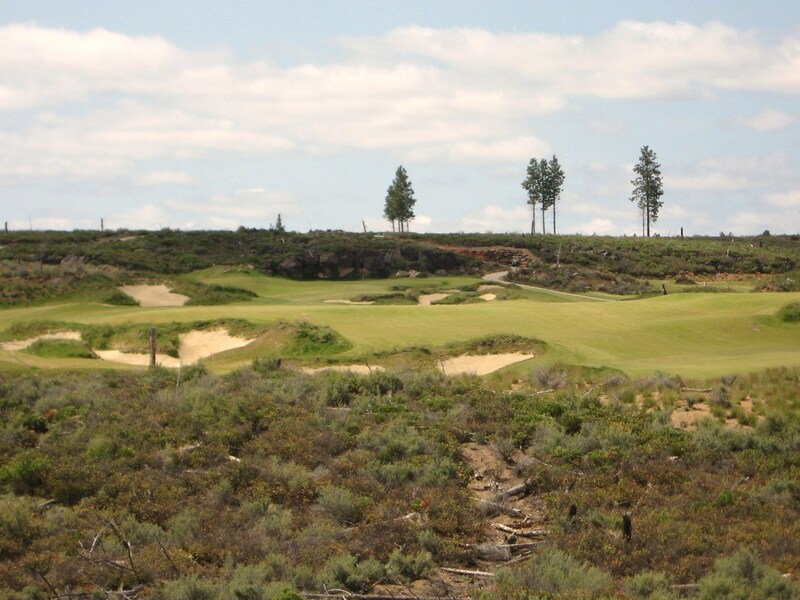 Kidd has melded the course seamlessly with the high desert environment and while it may not be as “natural” as some of the other tracks in the state, it does fit in very well with the setting. As a fescue based links style course, however, too many greens are raised and/or severely undulating which takes away the ground game that would make it more playable. 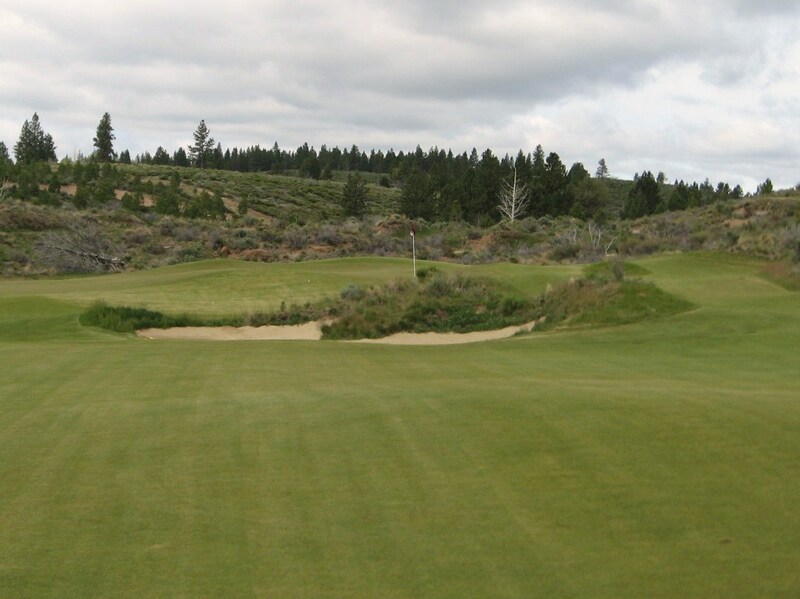 The Strategy at Tetherow is excellent and Playability has been improved since the course opened. 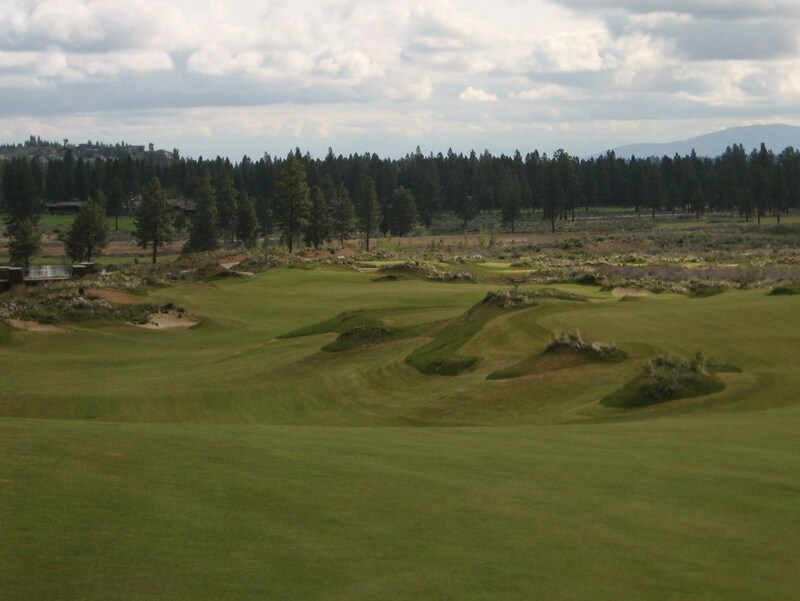 Tetherow remains a challenging course after all the changes but it is now a fair battle, and with five sets of tees and the removal of most of the fairway mounds and several bunkers, it will be more manageable for the average golfer. 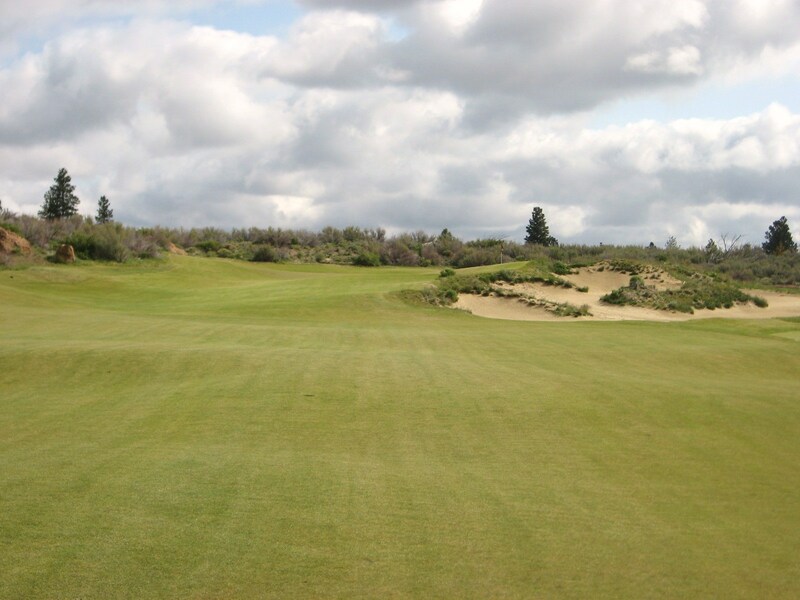 Strategic golf design had not been very prevalent in the Northwest until the creation of Bandon Dunes Golf Resort, as many of the tree lined parkland courses are very penal in nature. 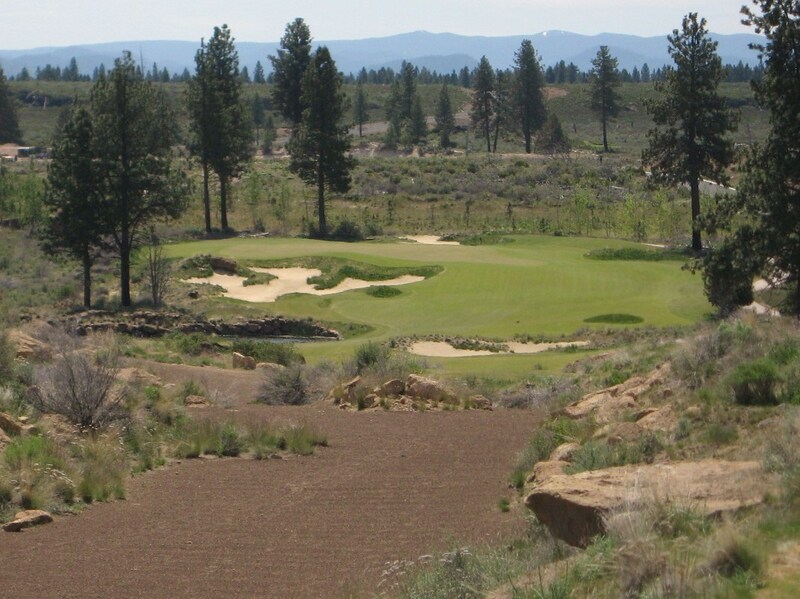 Tetherow is certainly a strategic course that will push every golfer to the edge of their ability. Low handicappers must shape shots and play to the appropriate side of fairways and greens, while high handicappers should focus on playing the right tees, keeping the ball in play, and two putting. Played almost three rounds out here this week and loved it. Caleb and the staff were great. 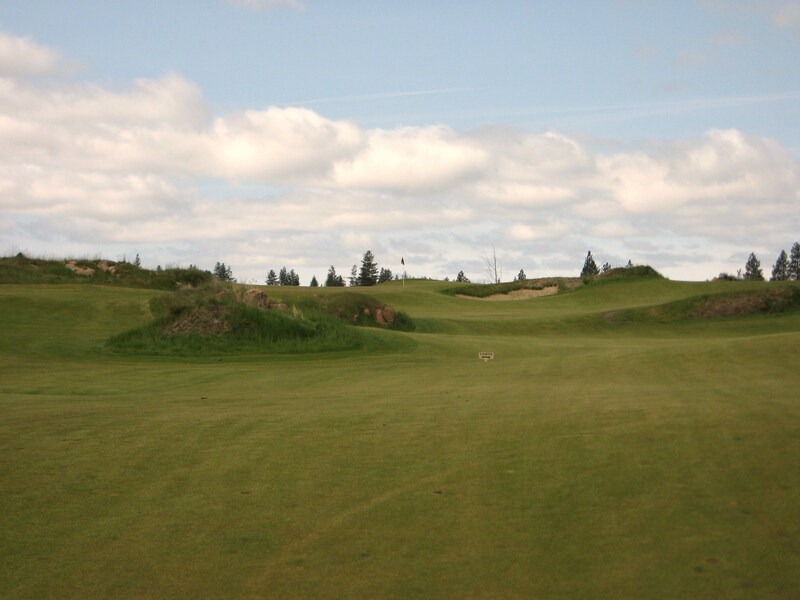 The course is a mix of Bandon and Chambers bay without the water. I think it’s a must play if your in the area. Played 2 rounds at Tetherow last week and loved loved loved the course. Our Caddie Ryan Field was a great guy and we enjoyed his company both rounds. I’ll never forget his quote ” Welcome to Tetherow” after struggling to putt on the first green. It’s hard to pick a favorite hole, but outside of #17 I loved holes #6, #8, #11 and #15.